When Logan and Brooke Fernandes got married in 2003, it was a low-key affair with just family and a few close friends present. 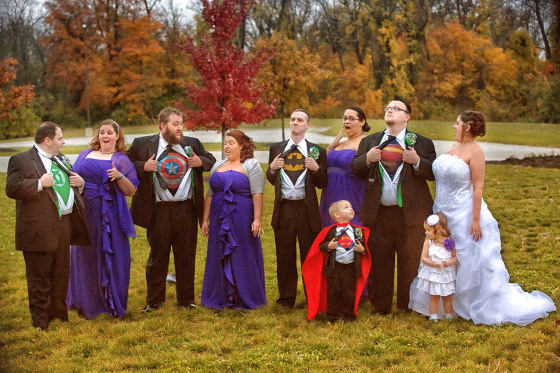 Ten years and two kids later, Logan wanted to do something really special for their anniversary, so he surprised his wife with the geeky dream wedding they couldn’t afford when they first tied the knot. The couple, who were high school sweethearts, originally bonded over a shared love of sci-fi shows and video games. “A lot of the shows we like, like ‘Firefly’ and ‘Doctor Who,’ we fell in love with as they came on and we discovered them together,” Logan explained. Their love of all things nerdy even affected their kids, who they named Kal-El (Superman’s original name on his home planet, Krypton) and Harley Quinn (after a Batman villain). So when Logan came up with the idea to throw Brooke a surprise second wedding, he knew the theme would be geekdom, and recruited his wife’s friend to sneakily get Brooke’s suggestions. “Her maid of honor, one of my closest friends’ wives, helped plan it and helped keep me on budget. 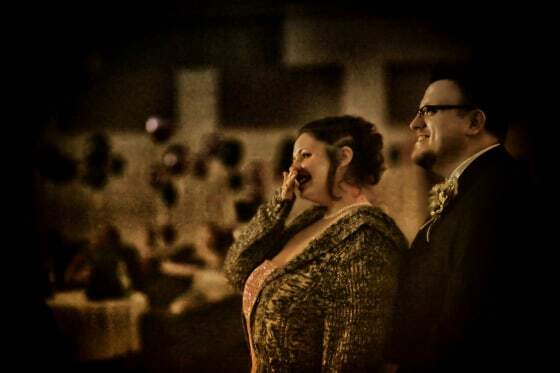 I couldn’t have done it without her,” Logan told TODAY.com, of how he pulled off the wedding planning. The friend told Brooke she was helping someone else plan a geek-themed wedding, and asked for recommendations about what to include. She then reported Brooke’s ideas back to Logan, who found ways to work them in. Brooke, who thought she was going to be a bridesmaid at Logan’s sister’s wedding (which did not exist), showed up at the event — and saw all her friends’ cars in the parking lot. Almost immediately, she started to figure out what was really going on. The couple’s son Kal-El, in a superhero cape. 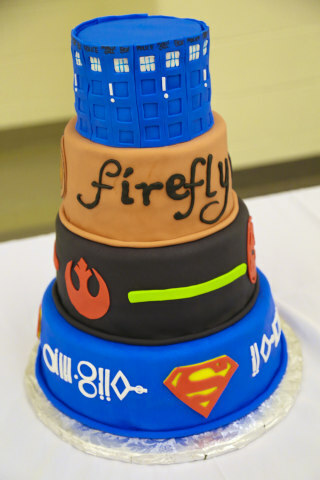 Everything was taken care of, including a dress in her size, a cake with different-flavored layers representing different geeky TV shows, and centerpieces with action figures and models of the Starship Enterprise from “Star Trek.” The groomsmen wore Green Lantern-inspired paper boutonnieres. 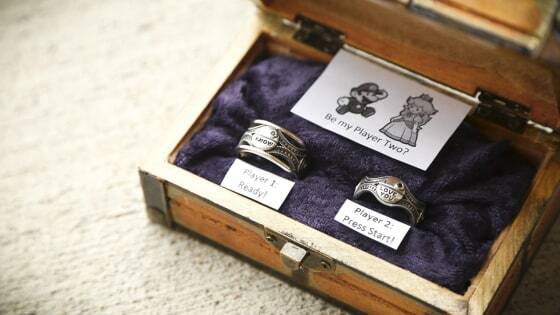 The rings, labeled “Player One” and “Player Two,” were next to a photo of Mario and the Princess from the Mario Brothers video games. 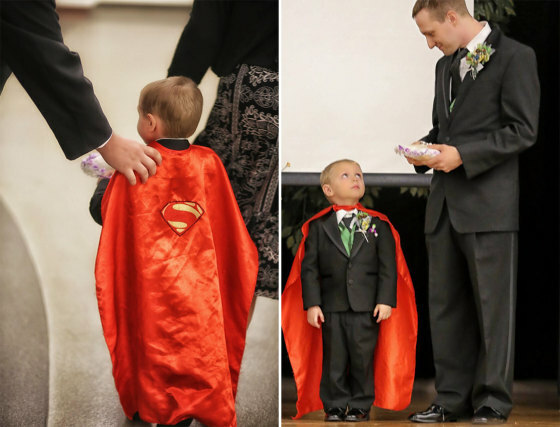 Kal-El was the ring bearer and little Harley served as the flower girl. “It was a really good surprise,” says Brooke, tearing up. The moment Brooke realized the surprise wedding was happening. After the big day, Logan proudly posted a few images from the wedding to Reddit. Immediately, other users took to the site to congratulate him — and to ask for more pictures. 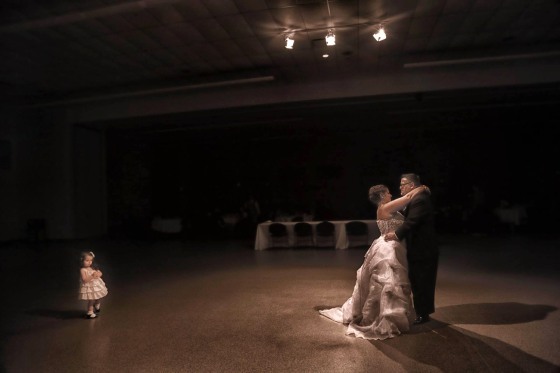 The couple dances at their wedding. Soon, the story went viral, and Logan and Brooke found their wedding photos circulating across the Internet. “You’re a very thoughtful man!” one Reddit commenter posted. “I am so very happy that you have each other!” added another. Still, despite the success of their big geeky wedding, there’s one downside to the story for Logan. “It’s not going to be fun next year when I say ‘oh, let’s go to dinner for our anniversary,’” he laughs.